Tube complement: 6A8G mixer/oscillator, 6K7 IF amplifier, 6Q7G detector, 6K6G audio output, 5Y3G rectifier, 6U5 tuning eye. Approximately 14-1/8 inches / 36 cm wide. The hole in the cabinet for the tuning eye was added after the cabinet was manufactured. The hole's inside edges are rough sawn and show bare unfinished edges that are unlike the other holes for the dial and the control shafts. 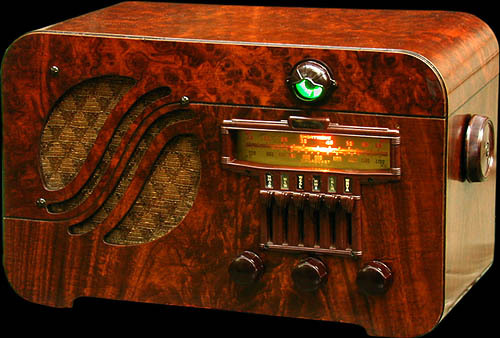 Probably the marketing department changed its mind and decided to add a tuning eye to this model after some units had been manufactured, so Belmont (the radio's manufacturer) went back and did some retrofitting. Speaking of the cabinet, the whole thing is finished with a paper finish, not real wood veneer. A wood grain pattern was printed on paper, glued to the plywood cabinet surfaces, and coated with lacquer. It's cheaper than real wood veneer, but quite good looking. Notice how the patterns on the front of the real radio above match the patterns on the radio in the catalog image below. They're offset slightly horizontally, but are otherwise identical. From the 1939 Spring and Summer Montgomery Ward catalog.